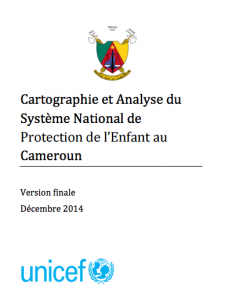 Working with the Ministry of Social Affairs and National Solidarity and UNICEF, the CPC Learning Network undertook a mapping and analysis of the national child protection system in Cameroon. This study not only consolidated significant learning about the government’s policy and service delivery framework for children and families but also explored how community members themselves—including mothers, fathers, boys, girls, traditional leaders, and civil society representatives—conceived of “child protection” and worked to ensure the protection and well-being of children in their communities. Compiling data from over 100 documents as well as 500 participants in interviews and group discussions in eight sites representing various socio-economic and cultural realities, the study contains key findings and recommendations related to a number of dimensions of the child protection: the policy framework; coordination mechanisms; human and financial resources; and service delivery mechanisms and processes. The analysis reveals the need for “child protection” to be firmly situated within the national development framework and for improved alignment between formal service delivery mechanisms and community realities. The report also contains six maps presenting the distribution of human resources, services, and structures for child protection across the country.